Well about time! It’s Springtime, baby, and with this sunshine, it means it’s time for our community and events update! Jim and Nancy LaHatt - Bellingham’s Cascadian Cowboy and his Burning Ember. It’s Block Party Season! And we’re kicking it off NEXT WEEKEND on Saturday, March 30th, with our 3-Year Anniversary Block Party! And this year, as we turn 3 years old and reflect on everyone who has been a part of of our family, we want to do something a little different. Rather than raising money for a nonprofit, we’ll be partnering with Jim and Nancy LaHatt to help support the staff and volunteers at Peacehealth’s oncology clinic here in Bellingham. Over the past several years, Nancy and her shabby, lesser-half Jim, have been frequent fliers at the clinic. You may recognize Jim and Nancy as the Cascadian Cowboy and his Burning Ember, and not only are they are huge part of the Bellingham beer and music community, they are especially important to all of us here at Stones Throw. So, along with our donation, we will be providing an opportunity for you to donate a dollar or two to the folks who are true heroes; the doctors, nurses, staff and volunteers combating cancer and comforting patients every day. Live music will start at 2:30pm with Broken Bow Stringband, and then The Penny Stinkers will take the stage at 5:30pm. Big Stick BBQ, Sage Against the Machine, and Street Dogz will be here serving food for the whole celebration all day long. Flagship Stones Throw beers such as the Neighborhood IPA and Raincountry Liquid Sunshine Pilsner-Style Lager will be on tap, as well as a special 3-Year Anniversary Beer Release! Secondly - thank you to everyone who has contributed to our fundraiser for the Pink Boots Society! Being part of the brewing community is special, something we cherish, and so we value the opportunity to host the ladies of the Pink Boots Society’s Bellingham chapter each year for the annual International Women’s Day brew and beer release! So far this year, through the sale of kegs to taphouses and breweries in the community and all of you purchasing pints of the Pink Boots “The Bruture is Female” Brut IPA here in the taproom, we’ll be donating around $1400 back to the Pink Boots Society! Don’t know much about this awesome nonprofit? The Pink Boots Society was created to assist, inspire and encourage women beer industry professionals to advance their careers through education. Want to donate? Come drink a Pink Boots Brut IPA while we still have it (or out at the many taprooms/breweries that also have the Bellingham batch), and be sure to ask our beertender if you’d like to donate an extra dollar or two with your beer and join us in this community! Of course, a huge THANK YOU to Skagit Valley Malting, who donated all the malt free-of-charge for the Pink Boots brew! - March 30th 3-Year Anniversary: Benefitting Bellingham’s Peachealth Oncology unit and Jim & Nancy LaHatt! - April 20th B’ham Beer Week: Benefitting the Northwest Straits Foundation! - May 25th Ski to Sea: Benefitting the Community Boating Center! And as always, you can find all of our live music schedules on the calendar on our website. 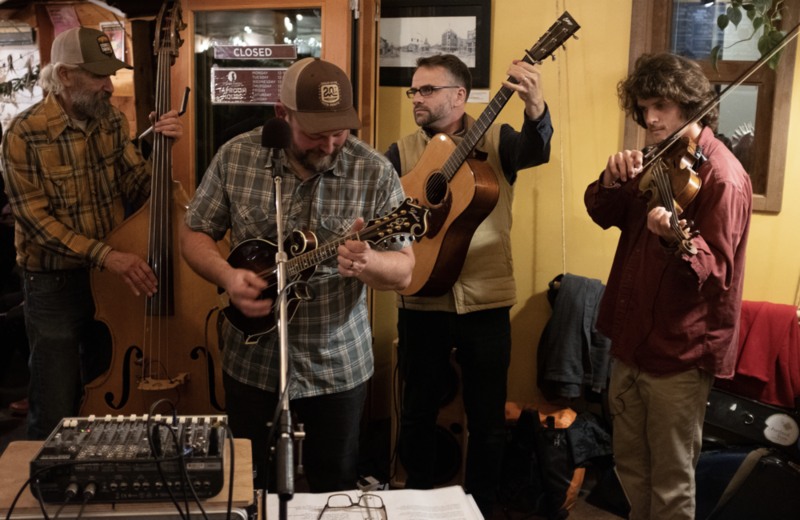 It’s a real treat hosting local musicians every Wednesday, Friday, and Saturday nights, and we hope our space is as fun, friendly, and lively for you as it is for us. Enjoy Spring, everyone! Also: Fairhaven Pizza is back open after a being closed for a few months this winter - be sure to snag a menu of theirs with your next beer and order up a pizza!